I’m a real beginner in watercolors and probably should stick to exercises and simple subjects, but that is not what I want to paint. I’ll look at some of my wildlife photos and think, “I’d like to try to paint that,” knowing full well that I don’t really have the skills to do so. I figure, though, that I’ll learn as I go along, seeing what works and doesn’t work. 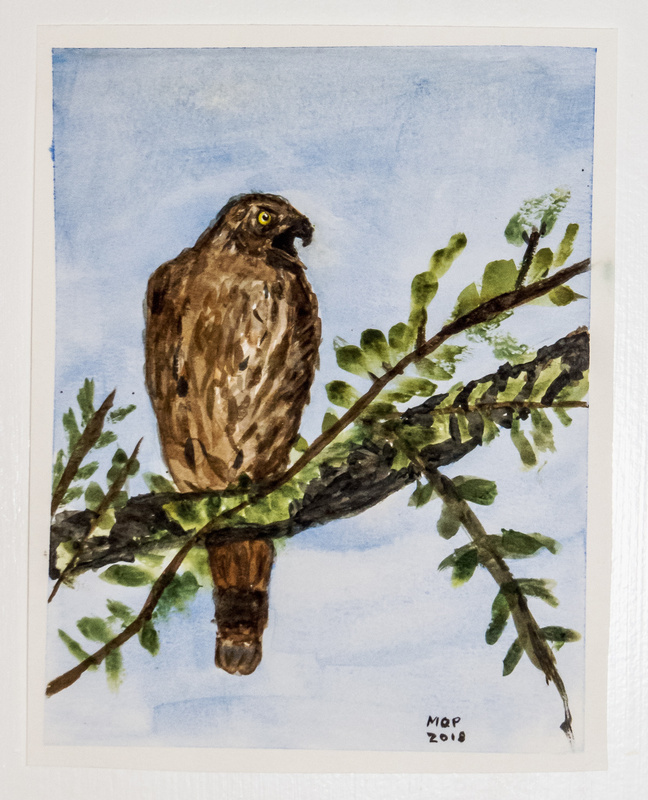 So yesterday evening I decided to have a go at painting an immature Cooper’s Hawk (Accipiter cooperii) that I photographed recently. I figured the best chance I had at making something recognizable was to simplify things, especially smaller, less important elements, like the leaves in the branches surrounding the hawk. I decided that I was not going to worry about making them realistic. I also realized that it would be tough for me to capture the fine details of the feathers, so I went for a more stylized approach. I decided to simplify my color palette too and used only three colors—lemon yellow, ultramarine blue, and burnt sienna. So what happened? You can see and judge the results yourself. Some parts of the painting came out pretty well and other parts could use a lot of improvement. I learned a lot in the process of doing this painting, most notably that I really enjoy mixing colors. It was rare that I used one of the three colors straight out of the pan, with one exception being the yellow eye. I paid a lot of attention to trying to vary my colors, especially in areas like the feathers. I didn’t really try to copy my photo, but thought you might enjoy seeing the photograph that served as a general reference for me as I painted. Thanks to the many readers who have encouraged me to keep painting. It is a little humbling to see how crude my initial efforts are, but it really is a lot of fun creating something from scratch—there is definitely something therapeutic about playing with paints. Benjamin says : “Mr. Mike, two thumbs up!” High praise from the toddler art critic. I think that you are stretching your own wings and soaring. Thank-you for sharing x 2!! Thanks. I suspected that Benjamin would like the subject. I am having so much fun trying to learn to paint and it’s great to hear he liked the painting. In some ways I am trying to put my inhibitions to the side, silence my inner critic, and paint with the enthusiasm of a child. Thanks for the words of encouragement, Ann. I understand that not everyone is quite as obsessed with dragonflies as I am and try to make sure that I include birds, butterflies, and other creatures in my blog postings. I think it is great and shows excellent promise! This is really wonderful Mike and I’m so impressed! What really struck me is that with your photographer’s eye you understood the vast importance of getting the eye right and you’ve managed that with great skill, succeeding in really bringing that bird to life. And you’ve got rid of the visual clutter and stuck to what matters. I hope you frame this and put it on your wall to celebrate a milestone in your artistic journey. Well done my friend! Thanks, Liz. This is actually the first “bigger” painting (about 8 x 10 inches) that I have tried–the others were a lot smaller. It is kind of a milestone of sorts, so maybe I will frame it. At the moment my skills are lagging a bit behind my knowledge–I know what I want to do in some cases, but I haven’t quite figured out how to achieve those results. I have greatly improved my eye and my sense of composition and colors as I have taken thousands of photos the past few years. I think that will help me in improving my painting skills. At the moment I am trying a realistic approach, but it is possible I may try to paint something more abstract. Sounds fun. Looking forward to seeing the direction in which you take it! Nice Mike! Looks like you are having fun at the same time. Plus think of all the watercolor paintings you can work on in those cold Winter months when it is either too cold to photograph or no dragonflies to photograph. Thanks, Reed. I remember the first winter when I was just getting serious about photography. 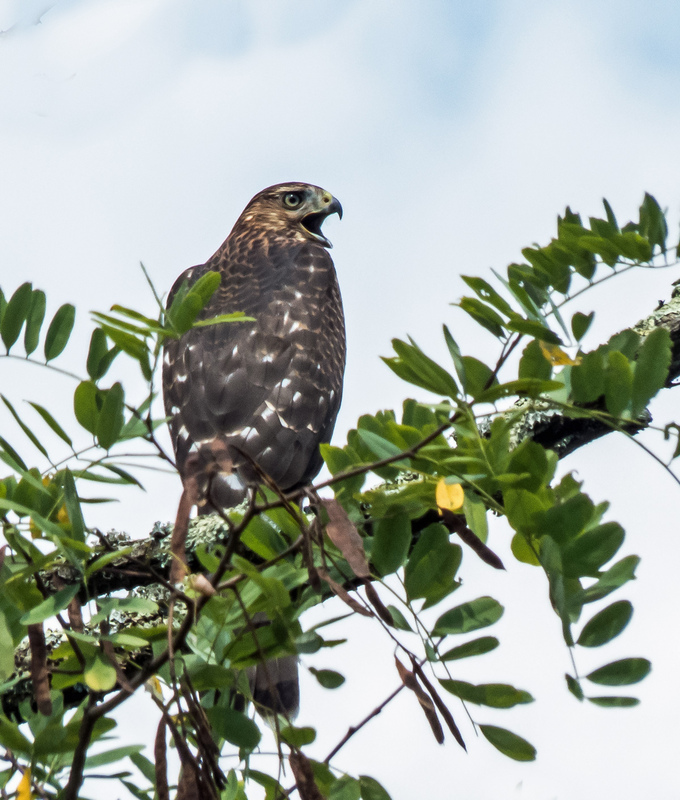 When the insects disappeared, I learned the joy of photographing birds, so I am outdoors almost the entire year with my camera. Great work, Mike! You are progressing nicely! I think simplification is the only way to go with watercolours… there is so little control in that medium and that’s the beauty of it! Thanks, Chris. There are some watercolor artists who manage to do some really detailed paintings, but that’s not really what I want to do. I hope to be able to paint in a loose way that is suggestive and expressive. At the moment I feel like I am playing around and learning a bit as I do so. There are a number of places not too far from where I live that offer classes and I can envision the possibility of signing up for one of them in the future. I’m very impressed — both with what you’ve achieved, and with your willingness to share the results. You might be interested in browsing the site of a friend who’s an artist living in Ecuador, and who often works in watercolor. She teaches, too — adults and children both — and she’s more than willing to talk about her techniques in her blog. This link includes quite a few posts about watercolor painting, as well as learning how to develop a painter’s eye. Even though I haven’t lifted a brush since about 3rd grade, I always enjoy her posts. Thanks for sharing the link. I am following that blog now and it looks like there are all kinds of cool posts to explore (and lots to learn). I, too, am impressed, Mike. Very nice and nice that you shared your thought process as well as the artwork. I agree with Liz about the eye, our goal in any image of a bird. Thanks, Ellen. The need to get the subject’s eye in focus was one of the first rules I learned when I started doing wildlife photography. Most of the time I follow the rule, though on rare occasions I will ignore that rule if I am trying to focus a viewer’s attention on something else in the image. I think these are pretty good, Mike, especially the second one. I like that you can show details with getting everything into a muddy mess. Sorry, I missed that. I still applaud the effort, Mike.